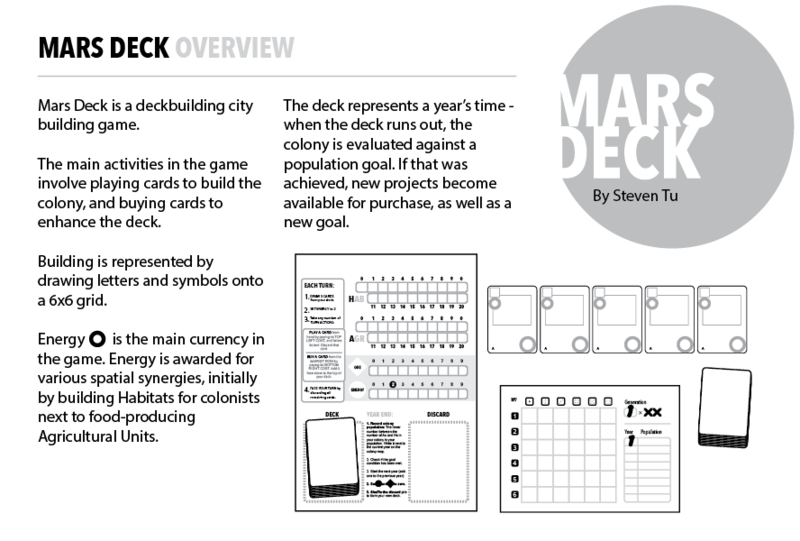 Mars Deck is a deckbuilding game about colonising the red planet. Increase your population by creating Residential Units and Farms, generating more energy to buy better cards that improve your abilities. As you cycle through your deck, the years pass and asteroids will strike and decimate your colony - outpace the asteroids to create a prosperous frontier city! I wanted to make a city builder with escalating possibilities. I couldn't quite figure out a "simple" citybuilding economic engine that felt satisfying, and ZANG I thought omg what about a DECK BUILDING CITY BUILDER!??! 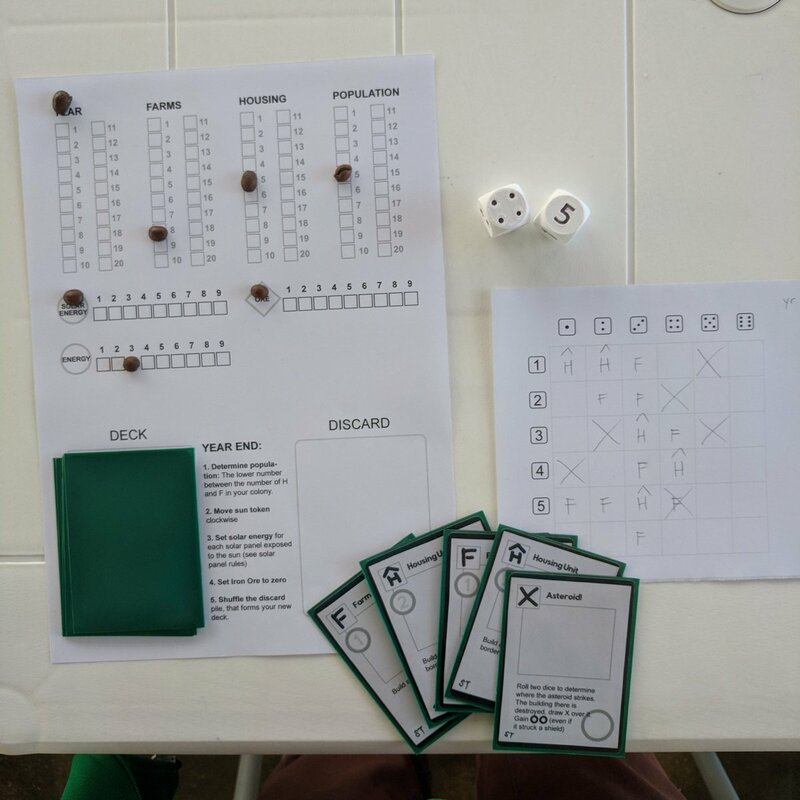 The idea wouldn't go away - and I realised that coding a deckbuilding AND citybuilding engine would be way too much for a jam, and I wanted to focus on designing the game rather than fiddle with the technicalities that gets in the way of getting to a game - so I decided to jam it in analogue, but keeping in mind that it's ultimate goal is to be a digital game. @Tuism, My initial thoughts/feelings without playing the game and only skimming the rules but also as someone that loves city builders. 1) I feel uneasy about having my major decisions be based on random draws. I feel a big part of the gameplay of a city builder is always knowing exactly what you can do and planning around when. You might not be able to do it because of constraints like money, but the option is not sometimes available and sometimes not. I feel if there are at least a basic set of beneficial actions available at all times, and the cards have ways that play strongly into the probability of drawing them I can at least make smart choices. If it's all based on what I draw though I believe I would get frustrated extremely fast. 2) I like the idea of making this a multiplayer game. I'm assuming that it's meant to be a single player game at this stage, but I find the idea of having multiple factions trying to control mars through building stuff interesting. For myself at least. It also gives incentive to players to make sure their decks are lean and mean when they are competing for resources. I'm not sure where you want to take this, if anywhere, but I'll try to give it a test over the weekend and get back to you with proper feedback. @Rigormortis thanks for your input :) They are valid points, but at this point I must ask: Have you played "deckbuilders"? There are many out there that utilise this mechanic, and it provides randomness while giving players control. There are many physical game examples with the granddaddy Dominion, then Thunderstone, Star Realms and more. There are videogames too that use this mechanic, most recently and notably Slay the Spire, Dream Quest, Ascension. I won't go too deep into why and how it works, but basically you start with a deck of 10 cards, with two main types. Your hand size is 5 cards, so you'll draw through your deck in two turns. Throughout the game you decide where to put your resources towards - growing your city, or growing your capabilities. As a single player game it's an ongoing puzzle. The idea to mix citybuilding with deckbuilding is that citybuilding by itself is a massive simulation and I wasn't convinced I could build a compelling "traditional" citybuilding engine AND a continually expanding one too at that, in a jam setting. So I thought I'd shift the focus to something I do understand and fit the expanding possibilities thing very well. 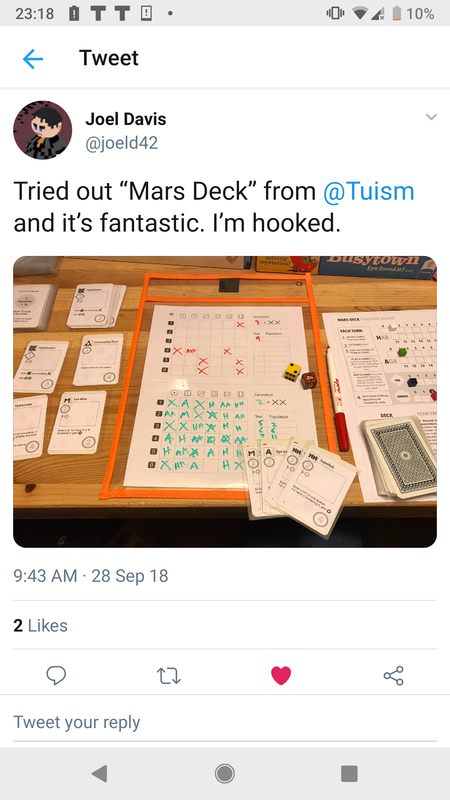 The actions felt meaningful and very much part of the Mars colony fantasy; the 2D grid for building was really clever, along with the obstacles and ways around them; good ol' deckbuilding; escalating options with the different stages of game; and a nice bit of risk/reward in terms of setting up the board for a really strong play while potentially having some event ruin your plans and force you to play a bit more reactively. I didn't play past the C cards (no time), but this really felt like a great design. I wish it was easier to set up and play (the problem with all print-and-play games I suppose), because I think lots of people would enjoy it. Yay! Thanks for the feedback! Yeah I'm the end it was intended to be a design for a digital (mobile) game, so if there's positive response I guess I have to work on that digital prototype! Thank you for taking to m the time to try it out!